I know that not all of you homeschool, but I know that a lot of you come to me for advice about homeschooling, so this year I took advantage of an opportunity to work with the Old Schoolhouse Magazine’s Review Crew to bring you guys some fresh ideas on making education work at your home. If you don’t homeschool, there’s still tons of information available here that you could use to supplement what your child is getting at school, fill in a gap in their learning, or meet a need for an interest they have that isn’t being met in the classroom. So, now that we all know what’s going on here…. 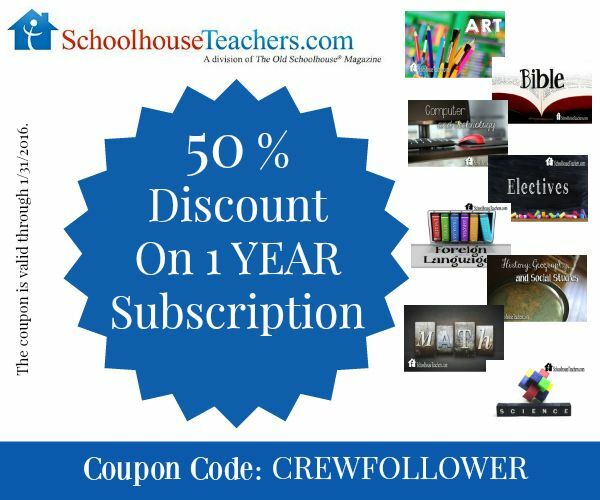 My first invitation was to review SchoolhouseTeachers.com‘s Yearly Membership. This amazing subscription service offers over 200 courses from preschool through 12th grade. There are classes on everything from math to computers to Bible to foreign language. There’s nutrition and fitness, geography, science, and even art! Now, as far as value goes, I think it says it all with the foreign language. If you’re teaching foreign language at home, or if you need a little extra help for your student, you can’t beat the price of SchoolhouseTeachers.com simply based on their courses in languages! You can join for $12.95 a month, or you can join for $139 for the year. A certain language course you can purchase that’s named after a famous rock (ahem, not naming names) is $99 for one level! What I was particularly excited about, though, was art. When we lived in Woodbridge we took homeschool art classes, which were fantastic, although with three kids the costs definitely stacked up. Now that we’re in Manassas, art instruction all falls directly on my shoulders, and let me just tell you I stink at it. I was never a particularly enthusiastic art student, and while I enjoy a good craft for me, I find making art with the kids to be stressful! I’m never sure how things will turn out, I don’t really have great ideas, and I just haven’t really been doing as well as I could have with them in this area. Courses are broken down for art by Elementary, Middle, and High School. Everything is pre-recorded, so you can take lessons in any order, take a break, skip ahead, whatever works for you. Since two of my kids are elementary and one is 6th grade, I decided we’d go ahead and try one of the Elementary options, which include South African Art Appreciation, Art Techniques, Elementary Art, and Everyday Easels. We ended up going with Elementary Art, which offers an initial twelve unit lesson on Great Artists. 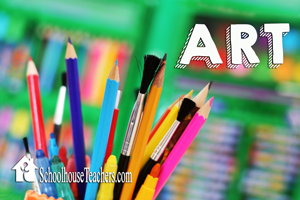 These are very simple and easy art lessons that I can add into our day without a lot of fuss or struggle- which is important with our schedule! I love that they’re really “grab and go” and designed to use what you already have. Our Michelangelo unit, for example, gave us just a paragraph or so of background on the artist, samples of his work to look at, and a suggestion for an art project we could complete with materials that were already in our house! Brilliant. I love that these can really be a “oh, we have time- let’s do a quick art lesson”. Savannah is drawing on paper taped to the chair- we learned about Michelangelo and this was the suggested project to replicate drawing on ceilings- minus the scaffolding! This was a big hit for me and my younger two, but my middle schooler was not impressed. Too easy, he declared. Well, fine. Since the subscription covers everything on the site, we’ll just switch you to something else! For him, we ended up selecting “Art Techniques” which offers various 4 module lessons on different media. Riley really likes chalk and oil pastels, so we decided to start there. I like that these lessons are written to the student. They tell them what materials they’ll need, and they walk them through the procedure for what they are to do. Oil pastels moved Riley from sketching the basic lines of a picture (day one) to a fully finished art work (day four). Since he can read the lessons himself and use the teacher’s examples for what he’s supposed to have accomplished by the end of the lesson, this is really something he can do in his down time between lessons. Next up, we are really excited to try the keyboarding and computer science options! I think that there is a bit of something for everyone on SchoolhouseTeachers.com, and we’re really looking forward to exploring it all as we have the opportunity! I think over the summer it will be really fun to let everyone pick their own unit of study for enrichment. I am 100% positive my middle child will be taking Geology (there’s 2 units!) and will be super excited about it!